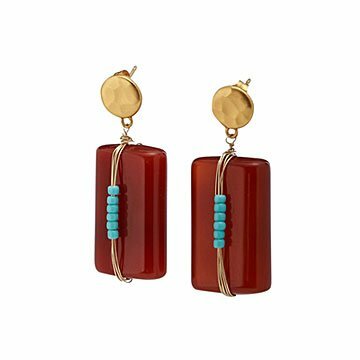 Nancy Nelson winds gold-plated wire and turquoise beads around carnelian to craft these bold earrings. Practitioners of crystal healing believe that carnelian, with its gorgeous amber texture and smooth surface, inspires boldness. Even if you're not so into the new age, these handcrafted carnelian earrings can help you make a bold statement. By selecting vivid stones and shaping them into sleek rectangles, Nancy Nelson forms versatile gems. Then, she winds them in gold-plated wire and adds turquoise seed beads. The finished pieces are chic enough to pair with elegant ensembles, but practical enough to add flair to everyday work looks. They're also exquisitely artful, making them a lovely addition to your favorite bohemian-inspired outfit. Handmade in Maryland. 1" L x .6" W x .3" H; Full Drop: 1.5"